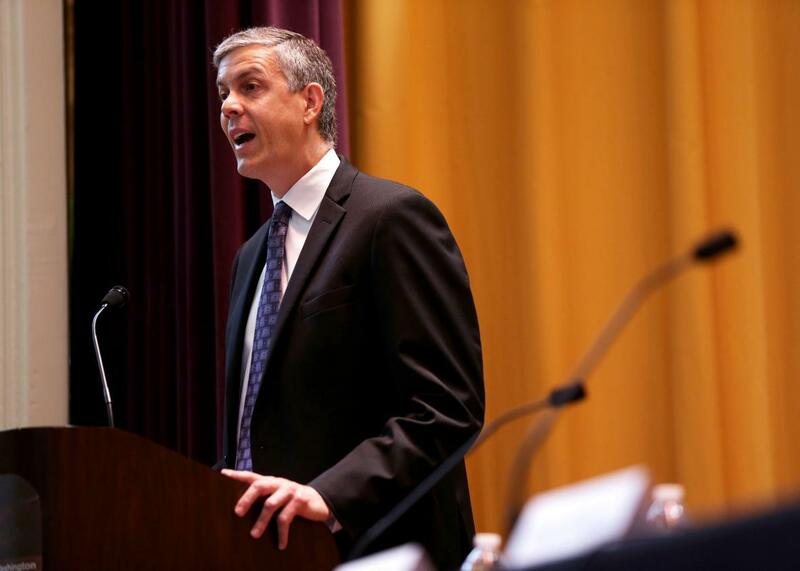 Arne Duncan to step down as U.S. education secretary. Arne Duncan is leaving his post as Education Secretary after seven years in the Obama administration. An unnamed source provided the Associated Press with a letter Duncan wrote his staff announcing his December departure. Duncan’s wife and children returned at the start of the school year to Chicago, where Duncan’s kids, after years in the Arlington, Virginia, public school system, began school at the private University of Chicago Laboratory Schools, where Duncan’s wife had taken a job. (Duncan is a graduate of the Lab Schools, which the Obama children attended before the election and where Chicago Mayor Rahm Emanuel’s children are currently enrolled.) In the letter, Duncan said that he, too, will be returning to Chicago to join his family. He had previously said he intended to remain in D.C. for the remainder of President Barack Obama’s term. Education Department official John King Jr. will step in as acting secretary through the end of Obama’s term. The president is expected to comment on Duncan’s unexpected departure on Friday afternoon. With Duncan stepping down, U.S. Department of Agriculture Secretary Tom Vilsack is the last member of President Obama’s first-term cabinet to remain in his original post.